There is a pattern in the frequency (or rareness) of my posts. When I’m focused on other writing projects, I also write more for the blog. When I’m traveling, interviewing, and attending events, I write less. This month I’ve been traveling. 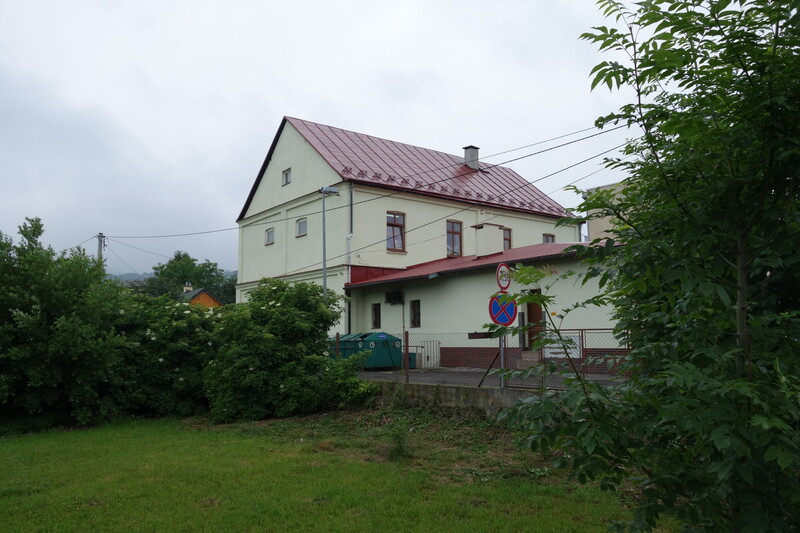 It seemed important to bring my new research focus to my old fieldsite, and see what is happening in relation to Jewish culture and history in the Bieszczady Mountain region. The Lesko synagogue. Destroyed in World War II, it was rebuilt in the 1960s. I’ve written elsewhere about how striking it is that, despite the fact that before World War II more Jews lived in Lesko than Poles, only very rarely have contemporary residents volunteered any information about the former Jewish residents. Even though I walked by the former synagogue (bigger than the Catholic Church) and the massive Jewish cemetery countless times, it really only sunk in to me last November that Lesko was a sztetl. One of my friends in Lesko described it really clearly. She said that somehow she always knew that the Jewish history of the town was something that you don’t talk about. It was a taboo topic. This has only recently started to change. Only in the past few years has she noticed that people talk about Jewish culture and history openly. She thinks this is a good thing. Realizing how little she knows about the subject, she has started to educate herself about prewar Jewish life and the Holocaust in Bieszczady. Interior of the Lesko Synagogue. Now owned by the town, it functions as a gallery of regional art. 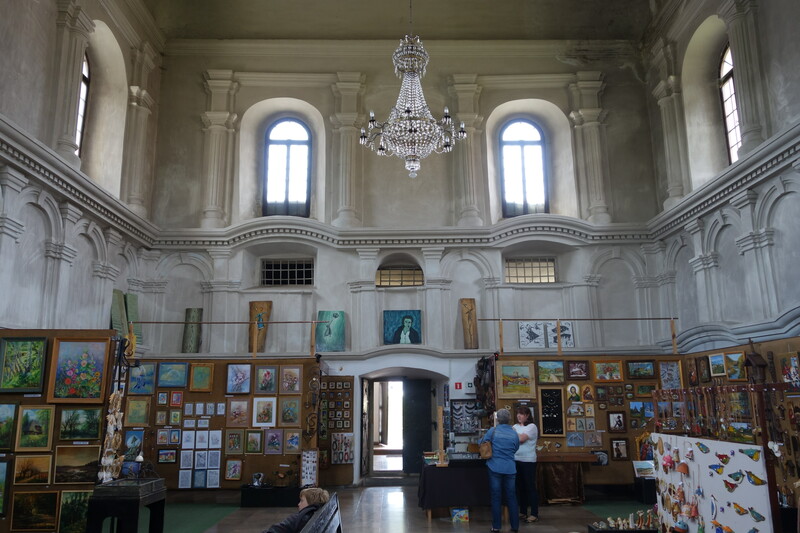 Generally, I have found that when I ask, most people have a story or two to tell about Jews in Bieszczady, either something they have read or a some fragmentary memory their grandmother told them. Though also when I told one friend about my interest in Jewish culture and history, she responded, “There were Jews in Bieszczady?” Even though she went to high school in Lesko, she only vaguely remembered the Jewish cemetery and had no recollection of the synagogue. Whether she really didn’t know or just continues to think this is a topic that polite people don’t talk about, I’m not sure. Nevertheless, some important grass roots work is being done: by Arkadiusz (Arek) Komski in Sanok, Ewa Bryła and her brother Piotr in Zagórz, and Jacek Koszczan in Dukla. Arek is working on a dissertation about the Jews of Sanok. 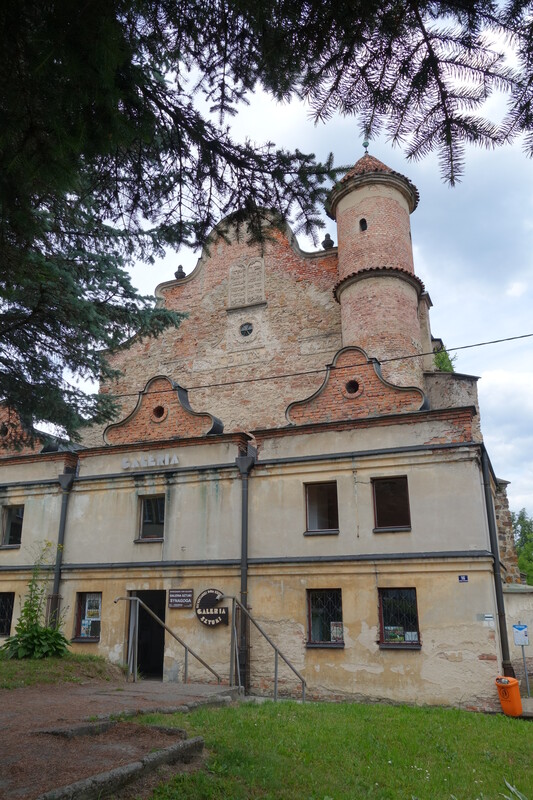 We met at the Słotki Domek Cafe in Lesko after he finished work, and then the next day he showed me the places associated with Jewish life in Sanok. His interest in the topic originated with a curiosity about history, and particularly the history of his hometown. He has published articles about the Nazi work camp in neighboring Zasław and about the locks that were found at the Jewish cemetery. 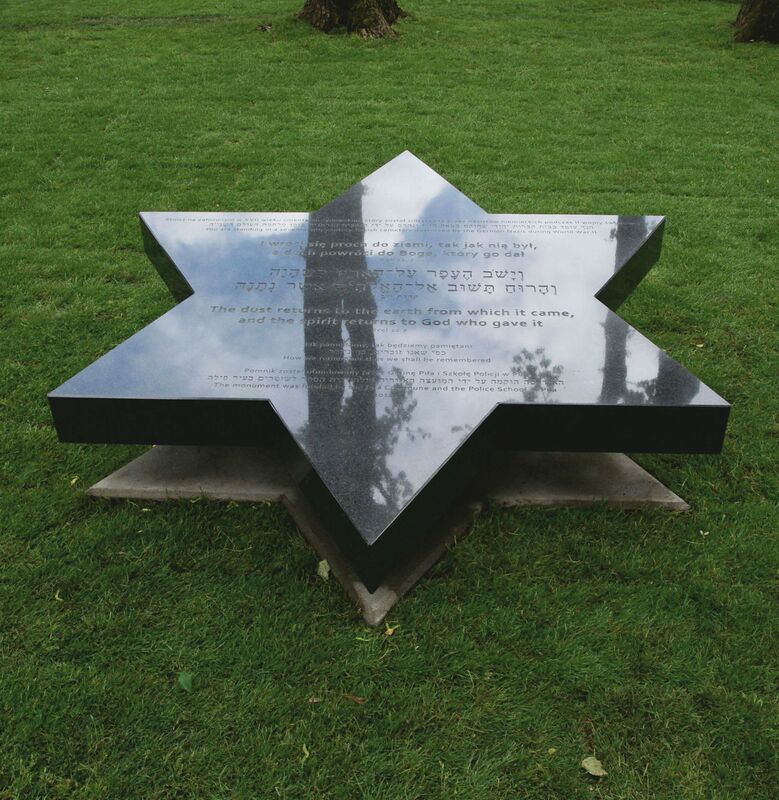 Last year, he realized a project to place a commemorative marker across the street from the former site of the great synagogue. Arek also let me know that he was awaiting the arrival of a group of students from Dartmouth College, led by Rabbi Edward Boraz, who were going to clean up and inventory the tombstones in the Jewish cemetery in Lesko (see Project Preservation). He has helped them already, first when they came to the cemetery in Sanok, then to Ustrzyki Dolne, Korczyna, and last year to Lutowiska. Through Arek, I met Ewa, who helped found the Stowarzyszenie Dziedzictwo Mniejszości Karpackich (Association for the Heritage of Carpathian Minorities). Arek joked that for Ewa, working on heritage preservation is a full time hobby. Her interest emerged out of her own Bojko/Ukrainian roots; her parents and grandparents spoke Ukrainian among themselves, though they only spoke Polish with her and her brother. To date, the association has helped clean up as many as thirty Uniate (Ukrainian) and Jewish cemeteries in the region. 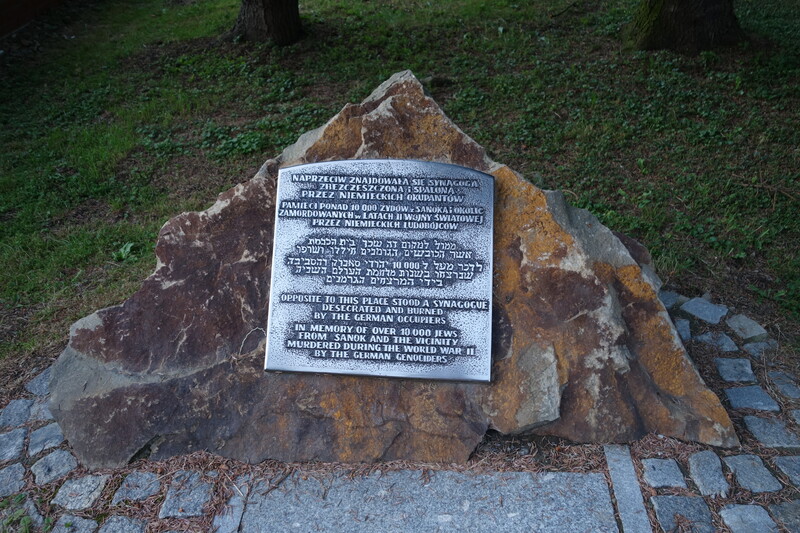 Another of the association’s projects is a heritage trail and information sign at the site of the Nazi work camp in Zasław. 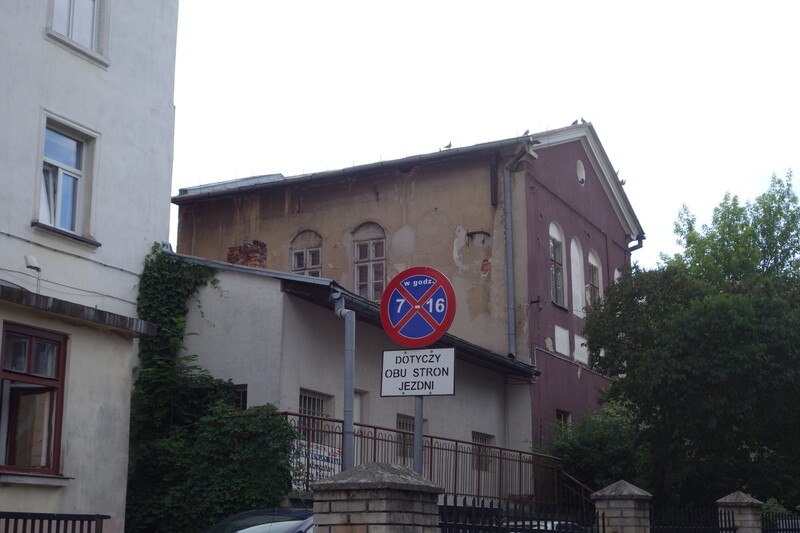 This is where most Jews from Lesko and neighboring communities were taken and forced to work at a neighboring factory. Approximately 10,000 prisoners were shot on the site, while perhaps 5,000 were sent to extermination camps at Belżec and Sobibor. I stopped by Dukla on my way back to Krakow, and despite the rain Jacek and Ania, who works at the local tourist office, showed me around. Jacek had already started collecting Judaica around the time of his retirement from the border patrol. An infectiously upbeat and energetic man, he needed something to occupy himself and so decided to get to work protecting and publicizing the sites associated with Dukla’s prewar Jewish population. He told me that the town was as much as 80% Jewish. We walked by the former Jewish school, where boys learned various trades. It is across the street from the old government building; Jacek says that the associate mayor used to be selected from among the Jewish population. Similarly, most of the stone buildings around the market square (rynek) were owned by Jews. Jacek told me the fate of the last rabbi who hid under his rynek home, but then was caught and killed by the Nazis when he tried to escape to Krosno. Two synagogues stood side by side. 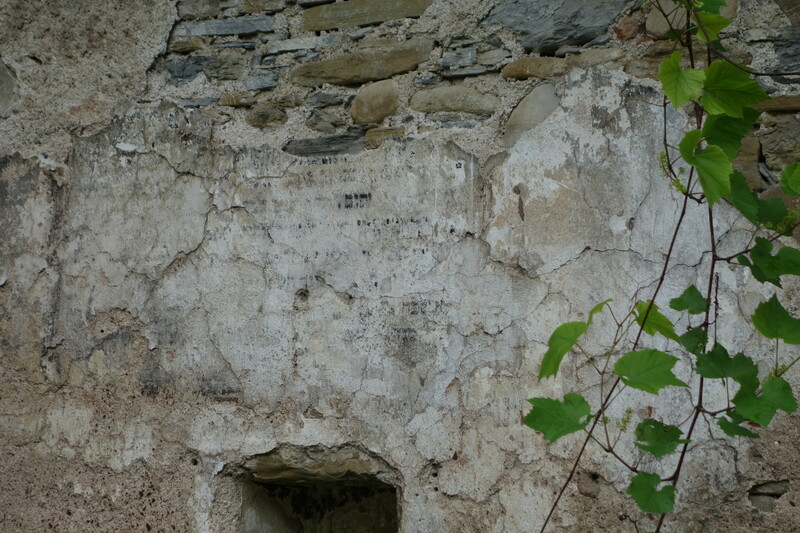 The one dating from the 18th century was burned by the Nazis with Jewish residents inside. The neighboring mykwa was also destroyed. 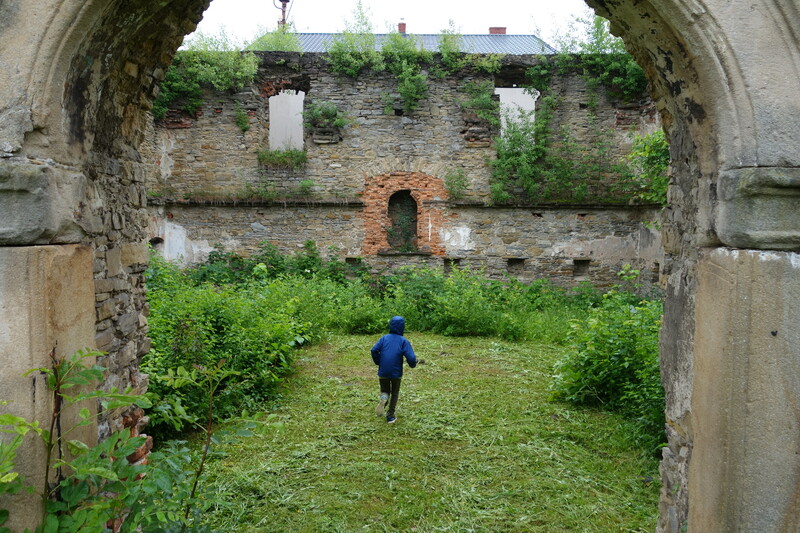 Jacek would like to see the remains of this synagogue conserved. All it would take is reinforcing the window arches and putting in a platform on the inside for viewers to walk on; right now a chain link fence surrounds the site. The other synagogue, dating from the late 19th century, is now a grocery store. 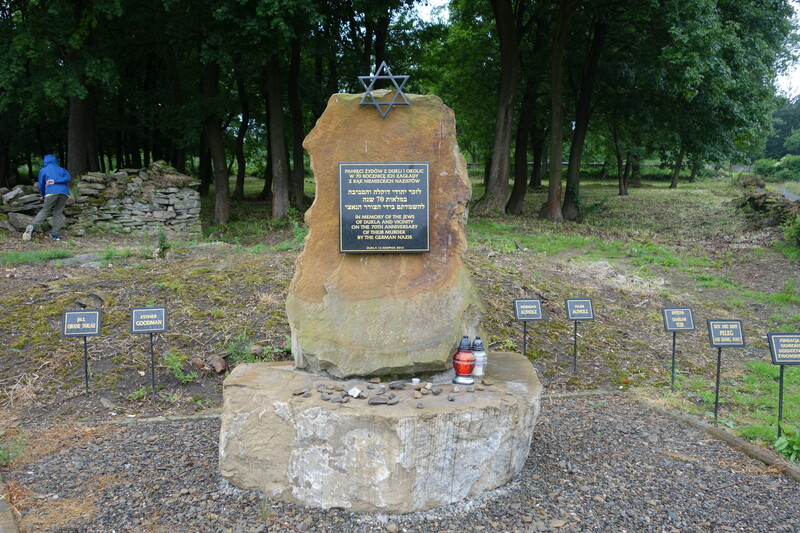 Dukla also has two Jewish cemeteries, the older one with burials up to World War I, and the newer one beside it used during the interwar period. Jacek mows them himself. 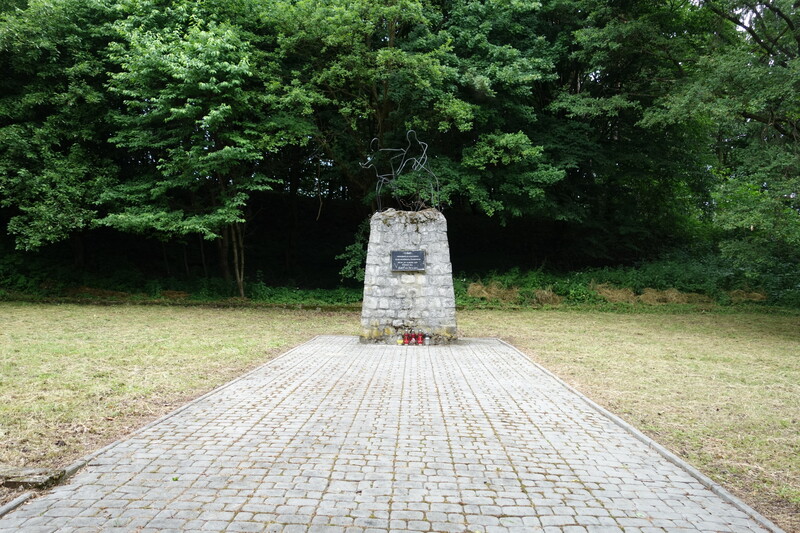 Jacek also coordinated the construction of a monument near the entrance of the old cemetery recognizing the 70th anniversary of the murder of Dukla’s Jewish population. Funders include the Foundation for the Preservation of Jewish Heritage (FODŻ) and descendants of former Jewish residents. While there have been many contributors to these various projects, Jacek is clearly the energy behind them, insuring that they are realized, and doing much of the physical labor himself. In each of these cases, someone (or several people) from the local community has taken the initiative to insure that Jewish culture and history is brought back into the public landscape. They are not Jewish themselves, but something compels them to remember, and to teach others about the former residents of their towns. After reading my previous post about Chil Majer Piwko’s death notice, my cousin Raphael from Switzerland sent me a couple more that were published the same day (June 16 1929). These were in the Yiddish newspapers Hajnt and Der Moment. Besides wanting to share them, this gives me the opportunity to revise what I said about Chil Majer. My conversations with a couple of readers helps me realize my hasty use of the term “assimilated” (even though it is widely used in the historic literature) probably does not communicate what I intended. What I meant to signal was that Chil Majer likely considered himself Polish as well as Jewish. But I have no doubt that he was also a very religious man. Nor did I mean to suggest he was on the road to adopting Polish culture in replacement of his Jewish faith. On the contrary, I’m interested in the places and spaces where Polish and Jewish affiliations intersected, complemented each other, or existed side by side. The fact that his death notice appeared in three Jewish newspapers emphasizes even more strongly the important position Chil Majer filled in the community. The Polish-language Nasz Przegląd tended to take a more integrationist stance, in the sense that it catered to Jews who were comfortable operating in the Polish language, and who tended to invision a place for Jews within the broader Polish society. The Yiddish-language Haynt and Der Moment were competing papers that were Zionist in orientation. As such, they tended to highlight the interests of Jews as distinct from the Polish (Catholic) majority. The publication of the death notice in both languages shifts the emphasis, indicating an allegiance to both Jewish autonomy and to Polish-Jewish allegiances. For more information about the Jewish press, see a brief summary by the Yivo Institute or Angela White’s dissertation on the Polish language Jewish press.